Tired of hearing the same ol songs? So is K-Def. From his House of Hits / Pirate Radio days (alongside the legendary Marley Marl), all the way through his current incarnation as a ‘producer’s producer,’ it is safe to assume that the New Jersey native knows a thing or two about records. 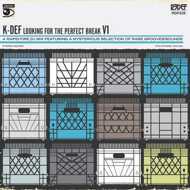 Looking For The Perfect Break Volume 1 provides a look into K’s world, where new breaks and grooves are continuously being unearthed at a breakneck pace and ordinary sounds are run through K-Def’s mixboard and morphed into new sonic creations. Much like the Chief Rocka himself, this live, 1-take mixtape on wax does not stand still for too long before K changes the pace and introduces new sounds into the sequence.